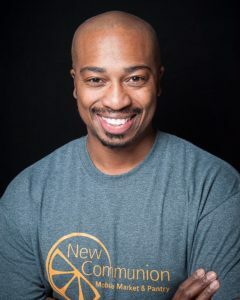 Reverend David Harrison Jr, Executive Director, of New Communion, is a native North Carolinian, married to Renee and father of two. Rev. 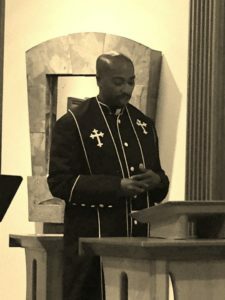 Harrison is an ordained Minister,and Chaplain with over fifteen years of ministerial experience and currently serves as Senior Pastor of First Christian Church (www.disciplesofchrist.com), in Winston Salem, NC. He spent most of his career as an Information Technology Manager, serving the Piedmont Triad Region. Despite having a thriving career, Rev. Harrison knew that he still needed to pursue his purpose, as he frequently encourages others to do. He left his career to pursue ministry full time. 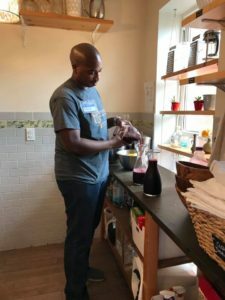 During this time, he would be able to merge his passion for God, People, and Food Justice, by becoming the Executive Director of New Communion. Rev. Harrison lives a life of service, with a concentration on community, justice and reconciliation. With a heart that is always concerned with the “least of these.” He firmly believes that there is room at God’s table for all people and a connection to God and creation can be found through the sacredness of a meal.